Last week, our PetBox Spokesdoggy was super happy to receive her PetBox for the month of May. She loves sniffing the contents of her box and picking her favorite items out. 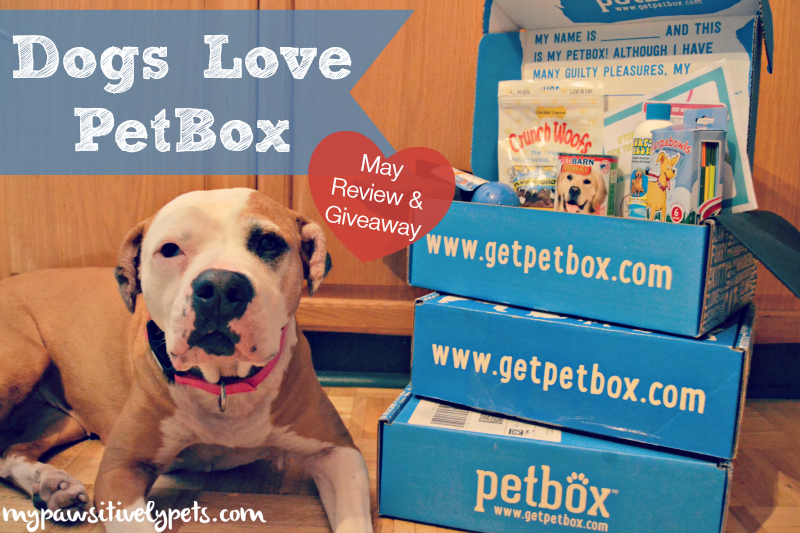 Each month, we share our review of PetBox with our readers and offer a chance for one lucky dog or cat to win a PetBox with a giveaway. Hydro Ball by Hugs Pet Products - One of Shiner's favorites from the box! Crunch Woofs microwavable dog treats - Also one of Shiner's favorites! Red Barn Naturals Stewey Louie canned dog food - Looks like good food! Slurpabowls - Portable and recyclable pet bowls. O'Tom Tick Twister - Hope I never need to use this, but it's for safely removing ticks. Slurp 'n Fresh by Enviro Fresh - Add to your pet's water to help eliminate bad breath and reduce plaque. There's a nice variety of items this month. We haven't had the chance to use everything in the box just yet, but will touch back on some of these things later on. Here's a quick look at a few of our favorite items from May's PetBox. I always let Shiner sniff around in her box. She's always a fan of toys and is usually quick to pick them out. She snatched her Hydro Ball up first to play with. She was so ready to start playing with it that she didn't even let me unwrap it first! In our action shot above, Shiner is getting ready to catch her Hydro Ball. Things didn't go quite as planned and the ball bounced back off her snout and hit my camera lens right on the money! This ball is meant for water play and has several holes in it. Shiner isn't a fan of getting wet, but she still loves the ball all the same. She hasn't destroyed it yet, so it's doing well in the durability department. 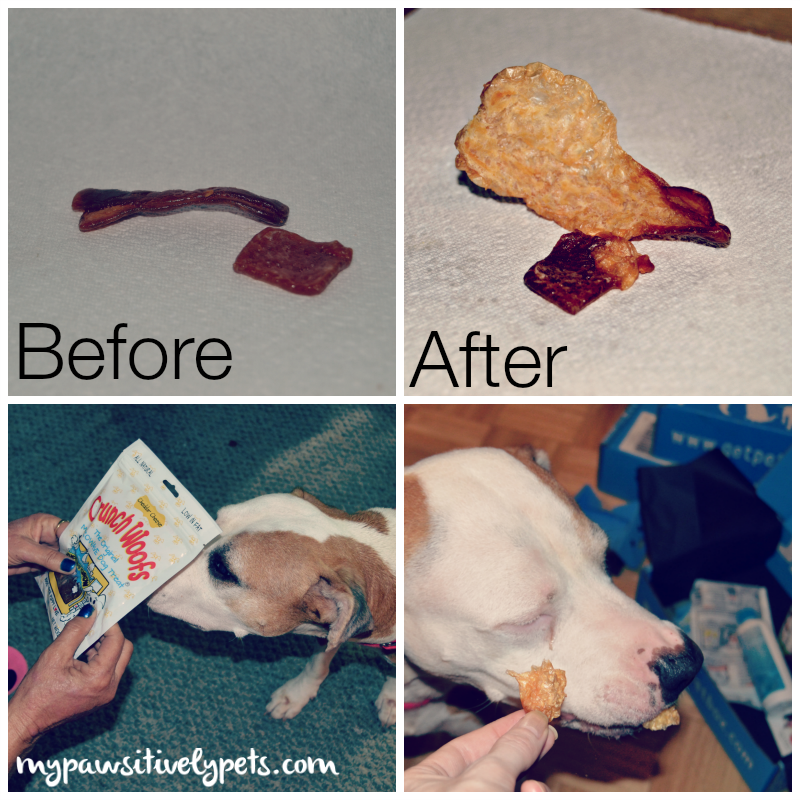 We both loved these Crunch Woofs microwavable dog treats. They are just plain fun! And Shiner thinks they are pretty tasty. You put them in the microwave for about a minute and they puff up kind of like popcorn. They are actually pork rinds. The treats have very limited ingredients - Rind of Pork and dehydrated cheese powder. That's it! 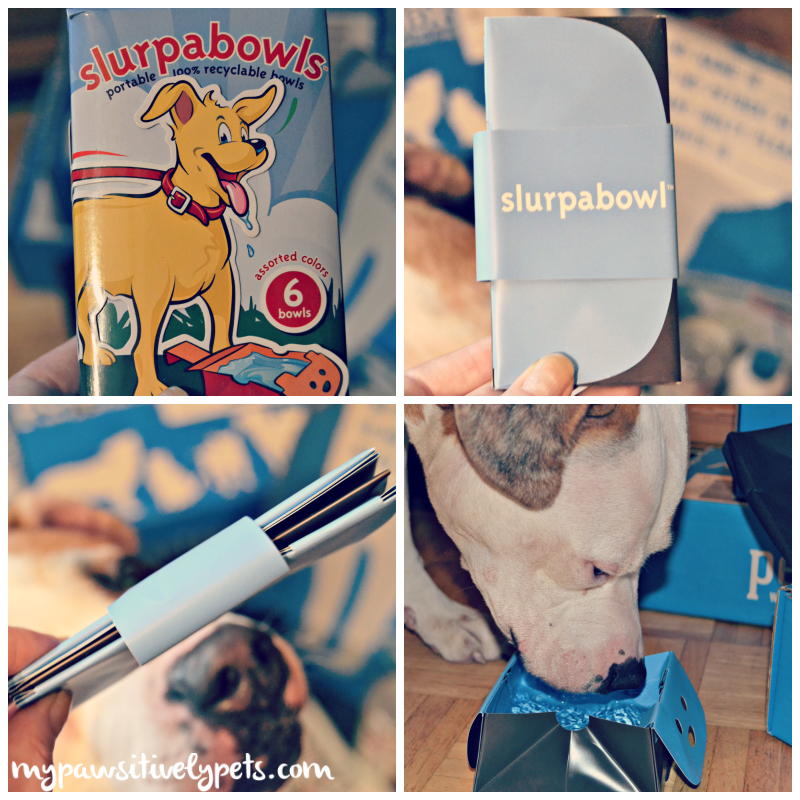 I really liked these Slurpabowls which are reusable, portable pet bowls. They hold up to 2 cups of water or food and are small enough to fit in your pocket or purse. They can also be easily clipped to your leash when you're on a walk. I think it's a pretty cool and convenient product. PetBox is the only customizable pet box subscription service. You choose what goes inside or keep it a surprise if you like. For a limited time, you can save 50% OFF on your first PetBox with the special discount code "PAWSITIVELY" at www.getpetbox.com! That's $20 saved ! This deal is available through May 31st and can also be used on any 3, 6, or 12 month subscription as well as a single box. Please not that it's 50% OFF the first box. Don't forget - they make PetBox for cats too! 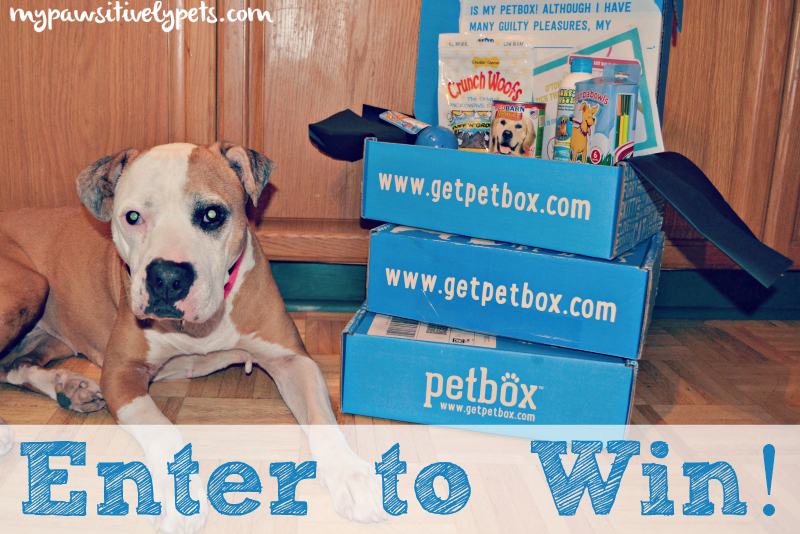 Want to win a PetBox for your dog or cat? Enter our monthly giveaway! All you have to do is fill out the Rafflecopter form below with as many or as little entry methods as you like. Contest is open to US residents only please. This giveaway ends on May 21st at midnight CST. Winner may chose either a dog OR cat box. Good luck! We received a PetBox free of charge in exchange for our honest opinion on the product. All thoughts expressed here are our own and truthful! I'd like to win because I take in rescue dogs (German Shorthaired Pointers) and can always use lots of doggie stuff for my foster furbabies! We so liked the slurp bowls what a great idea. Obviously do not include us. Have a marvellous Monday. hahaha, your face while playing with the hydro ball is priceless! the slurpabowls are a super idea, we will look if we can get them in our stores too. Have a super monday, Shiner and enjoy all those fabulous treats! She's getting ready for the big catch! But a lot of times the ball does fly around and bounce off her snout. That box looks cool! The bowl is definitely neat and would come in handy!!!! Great review and good luck to all who enters! Crunch Woofs sound tasty - I could see both Harley and Leo enjoying those. olivia would like to win because she's been dying to get one of these monthly pupscription boxes! Great dawg, there is a LOT of great stuff in your PetBox this month! Treats that puff up in the microwave?!? They sound like something I would love to try! Happy Monday, Miss Ann and Shiner! Oh Shiner, you get some of the coolest stuff! I would love to try PetBox because you get to choose your own items. So awesome! Id love a chance to try out a box. Well, hope we didn't ruin the surprise for you since you guys are out traveling right now. It's another good box though! I'd love to try a cat petbox because my cats would enjoy it. They love getting goodies in the mail. shiner....awesum petbox thiz month.....de slurp a bowls wood bee a nice thing ta add two a travel///emergencee kit !!!! Hey - good idea for the emergency kit! Didn't think of that one. 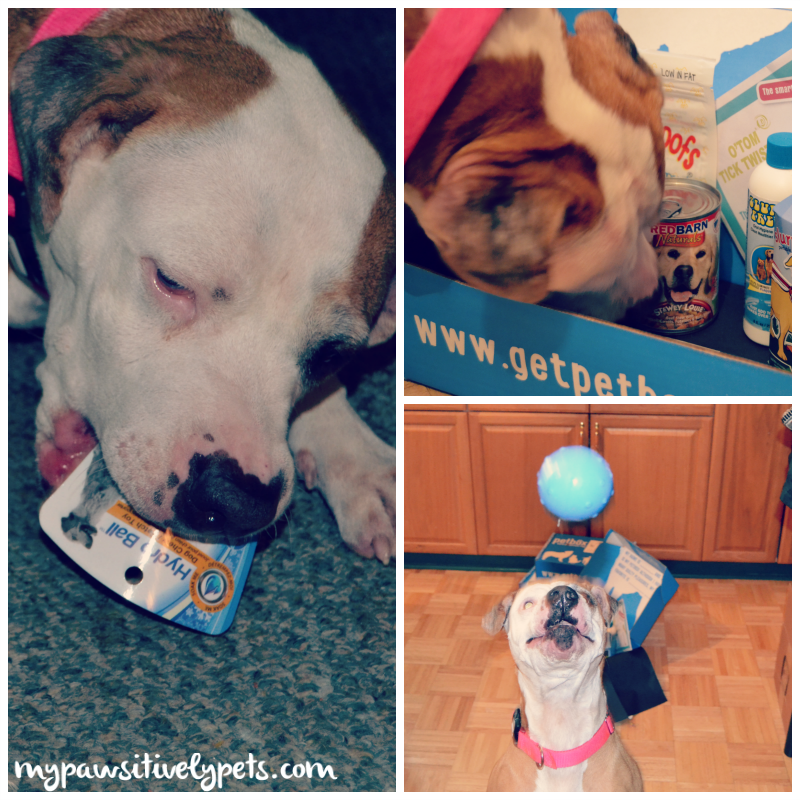 I want to try a dog petbox because it looks like Kamana would enjoy all of the goodies. You had Rita at "pork rinds". She would love to win! Would love to share one of these boxers with my 6 pups! Do you know the May PetBox for cats contains the Organikat toy I’m giving away. Shiner looks like she boves those Woofs. That's pawsome CK! Wish I had a kitty so we could try out a cat box sometime. All the reviews I see of them look pretty cool. We love subscription boxes, and I always love getting fun mail! I want to win because I have five cats and two dogs who want to try this! Awesome! We would love a chance to win. Thank you for the opportunity to try PetBox. Those Slurpabowls are so cute - I was very tempted by them in my last order. One of the reasons I love PetBox is because they also cater to cats! I love my dogs and would love to try this to see if they like the items. Thank you for the giveaway. I am excited to win this box for my brittany puppy named Radley. The Slurpabowl would be great for all the mini trips we take him on to dog park and dog beach. I know Prince and Nadie would love to win this. They would love the goodies in this box! I want to try PetBox because there will be new dog stuff that my dogs have never tried before, what a great way to discover fun new things. I want to try PetBox so I can spoil my dogs. They have been my constant companions during my college finals and student teaching. Fang would love to get this -- looks like great stuff! I love that you can pick your own products- I hate paying for boxes then not being able to use half the things. <-- YoYo would luv to win one because he deserves a little surprise ! Lots of cool stuff in that one! I love to get a surprise for the pets, it's so much fun, and such a good chance to try out some stuff we might not otherwise. For the giveaway, it can only be either/or. I'll have to ask if you can mix and match with subscriptions though. I think my dog is going to love this product for a special treat. I would like too have either one of them as my cat or dog would be so surprised with a box full of treats and toys. It would be just a special treat for one of my animals. I would love one of these for my kitties. I was researching pet boxes and saw your link on twitter. I want to try Petbox because my 2 dogs would love it. I want to try it because I have four dogs so petbox will save me time trying to figure out what each of them like. I want to try this box because I spoil my favorite canine....she deserves it. My dog is the gentlest and sweetest creature in the world, and everyone in my family has been so busy the last couple of weeks that we haven't been able to give the attention she really craves. PetBox would be a nice way to make it up to her. I have been watching my cat from hell and its making me super guilty that I don't have enough cat toys for my babies. Looks like a great deal for all you woofies out there! Kittehs too! I'd like to try it because it contains things that are new or unknown to me. I'm always looking for new things for my pets.